When one goes camping, the amount of supplies that you need to bring can be overwhelming. 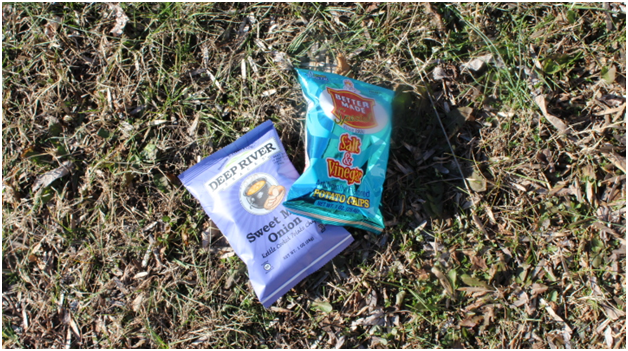 Below are a few of my favorite camping hacks for eating that you may have not heard of. These hacks will help you save time and reduce your load when it comes to packing the camp kitchen. The first hack I would like to talk about is recycling for your future dinnerware. But before I move on to this hack, I would like to caution you. This hack is only designed for cold food, which includes salads, cereals and the like. Now that we know the ground rules, let’s take a look at what will be our trash. Since you will need to carry out your trash, why not turn it into something useful before you dispose of it. This includes repurposing plastic yogurt and fruit cups as bowls. Another idea is to carefully open up a single serving potato chip bag, rinse it out and use it as a bowl. Or, cut the top out of a foil pouch juice box. Clean it out and now you have a bowl or a cup for water. If you do not want to go to the trouble to rinse out your food containers after they are empty, consider making a survival bowl out of a camping staple-duct tape. The last camping hack has to do with a cooking method that turns out to be an eating container also. What is this magic cooking method? Well, it is cooking in tin foil. But before we get into how to eat out of the tin foil, let’s learn how to cook in it. The process is really simple. The key step to success is to unroll your tin foil to the point that it is twice the size of the food that you want to cook. Yes, I know this sounds complicated but it really is not and you can simply just eyeball it. The next step is to decide how you are going to cook your product. The choices are steaming or roasting for meats. The cooking type will determine how you wrap the food. If you plan on steaming some vegetables, the best wrapping technique is to pull up the ends of the foil and roll down but do not roll all the way down. To properly steam, one must leave some room in the foil packet. Once that is done, seal the sides up by rolling them toward the center. The second technique for rolling tin foil should only be used if you have meat in your foil packet. This technique is the same but you do not leave that space in the foil packet. The best approach is to roll the tin foil packet as tight as you can around the food. Regardless of which tin foil technique you use, the simple fact is that once the dish is done you can just slit open the packet and eat. One cautionary tale though, if you have young children eating or you are simply concerned with the heat from the foil, put the foil packet on a heat resistant table or plate.